I was one of those attending the FROG training courses in June 2009, and have written this report to show how these newly-learned skills have proved useful in Kent. There are a number of places in the county where archaeological finds of pottery, wattle and timber can sometimes be found on the foreshore at low tide. At one of these locations, in eastern Kent, the beach is eroding quite rapidly; in 2009 it seemed that several timber features and the remains of wattles in the intertidal area were in danger of being washed away. As the landowner and County Council had no plans to record any archaeology on the beach, I thought I might try to put our FROG training into practice. In fact, to reinforce the FROG training I also enrolled on an excellent week-long training course at Bexley Archaeological Group. When contacted about the proposed survey, Kent County Council’s archaeological department were very helpful and put me in contact with a professional archaeologist who lived not too far away. He provided invaluable advice, and recommended I contact another archaeologist who is an expert in identifying ancient pottery. The County Council were willing to fund a quick visit by a surveyor who provided positional information for several key features and fixed reference points, using GPS. It should be emphasised that the plan was to for a surface feature survey with no excavations. Of course the sea is steadily excavating the site by erosion, removing 10 centimetres depth of beach per year in certain areas, and no doubt if we are patient most of the archaeology of the beach will be revealed in due course. Surveying and recording features started in earnest in late September 2009 and continued as time allowed into the new year. As with other sites on the foreshore, this location presents a number of potential challenges to anyone trying to make a record of the archaeology there. These include long-term erosion by wave action, short-term accretion of silt and shingle under certain weather conditions, beach combers and metal detector operators who visit the beach regularly. Features recorded included potsherds, bones from domestic animals, peat, wattle, and round timbers and split timbers embedded in the clay of the beach. 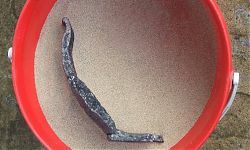 Some of the potsherds can be provisionally dated, using characteristics such as the shape of the rim, shoulder or base, or in some cases a particular texture. The range of pottery found extends from provisionally circa 800BC up to Roman times. Fortunately during this period Bexley Archaeological Group hosted a number of one-day training courses on the subject of identifying animal bones. These showed that the bones found in the survey are from oxen, horses and sheep (or goats), with a small number of bones from dogs and pigs as well as a piece of roe deer antler. The results of the survey were written up as a report and submitted to the County Archaeologist in May 2010. 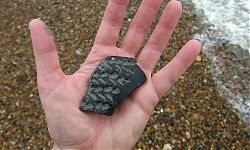 However, the beach is still being checked regularly for any emerging archaeological finds, especially potsherds, which continue to be uncovered by the ongoing erosion. In the course of the survey I was fortunate to get to know two local residents who both have a good knowledge of the beach and have been finding archaeological material there from to time for at least a decade. I am also fortunate to have extensive advice from a colleague and his various contacts who have all known this beach for many years. So there is a considerable amount of knowledge and interest in this area. We have had a few get-togethers to review the various potsherds that have been found, and of course we discovered that several people each had pieces of the same pots. Attempts are now being made to see if some of the pots can be partly reconstructed. It is hoped that, with some professional help, it may be possible to publish a formal report about the Iron Age pottery found at this site in the not too distant future. So far there is not enough evidence to explain the origins of the various timber and wattle structures. Moreover we have not yet secured funds to get any of them carbon-dated. We can speculate that the layers of peat found in several areas on the beach may represent the changing course of a local river, and may date from particular storm and flooding events. If there are any archaeologists – and especially environmental archaeologists – who would like to investigate this area further, please get in touch before it all gets washed away. The Greater Thames Research Framework has recently been revised and updated; you can read it here. 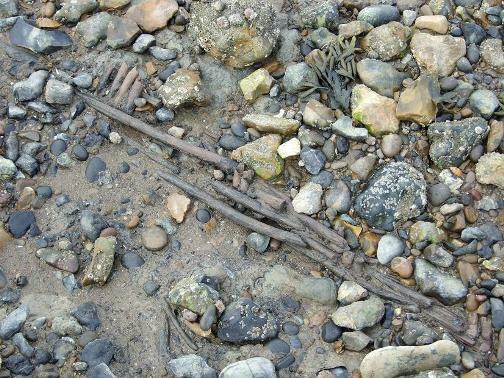 There’s also information available online as a PDF about Wessex Archaeology’s work on the inter-tidal zone in North Kent (near the River Medway) here (PDF 4020KB).